Jamie Buhr accepts the Citizen of the Year Award. 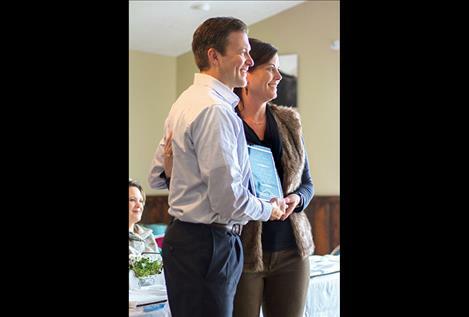 Robbie Gauthier receives a hug and the Ambassador of the Year Award. 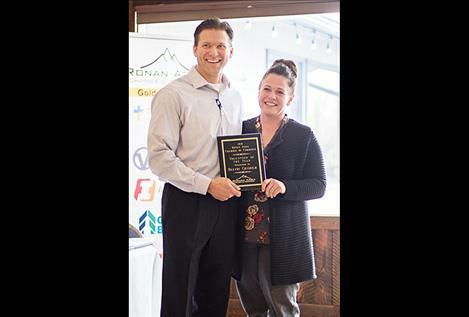 RONAN – The Ronan Area Chamber of Commerce held an awards luncheon last Thursday to honor people, businesses, and organizations that have made a difference in the community. The event was held at the Allentown Restaurant at Ninepipes with about 50 chamber members and guests present. “Our valley is very blessed with the support we have from so many people here to make it better,” chamber member Heather Gray said. Chamber honorees included Valley Bank, Business of the Year Award; Jamie Buhr, Citizen of the Year Award; Brandy Chisholm, Volunteer of the Year Award; Robbie Gauthier, Ambassador of the Year Award; Frank Sucha and Celie Aylesworth, Teachers of the Year Award. “Their appreciation is very humbling,” Volunteer of the Year Award recipient Brandy Chisholm said. The Chamber also recognized and honored former chamber board members Brandy Chisholm and Karen Dellwo for their service and dedication to the community.